The first step to save energy in existing buildings is to set a baseline or “benchmark” of current energy consumption. Building energy benchmarking allows a building to be compared to itself over time, to other buildings of the same type, or to an applicable energy standard. Because benchmarking buildings is so important to achieving reductions in energy consumption, some states and municipalities have committed to benchmarking policies. MEEA assists Midwest cities and state governments with collecting internal data, utility energy data acquisition and benchmarking programs for publicly-owned buildings. State benchmarking initiatives and policies can be found on respective state policy pages. 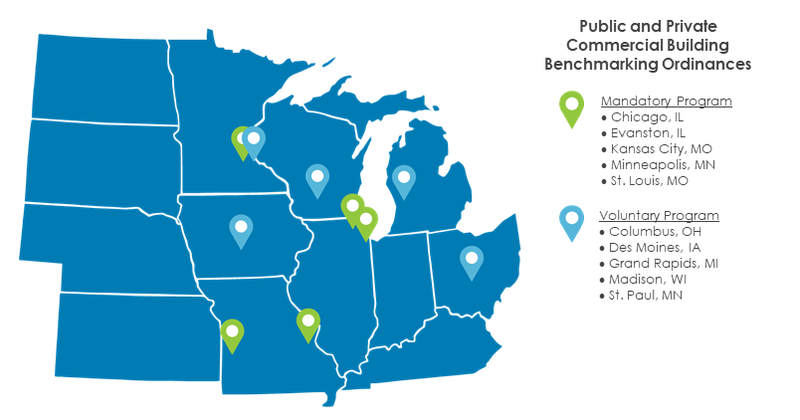 In the last few years, MEEA has provided technical assistance to Evanston, Minneapolis, Chicago and Kansas City to complete and implement benchmarking ordinances. These initiatives combined both public and privately-owned building data submission and led to the disclosure of annual building energy use to the market. By developing an ordinance, a city obtains the data to track annual energy use of the city as a whole and measure greenhouse gas emissions, helping to inform a city’s overall energy reduction goals.